Co-founded in 1997 by Jimmy Stein and Shooter Stein, National Certified Alarms, Inc. identified and addressed a clear demand within the Nashville community: the need for affordable alarm monitoring services. More than 20 years after serving its first customer, NCA serves now thousands of households throughout the greater Nashville area at the same low signature rate of $9.95 a month. CEO/President, National Certified Alarms, Inc.
Shooter Stein went on to forge a rewarding career in marketing, where he gained experience working for a national agency, a publishing company, and doing direct marketing for the trucking industry. Shooter co-founded National Certified Alarms, Inc. with his father, Jimmy in December of 1997. Shooter Stein is a certified “Qualifying Agent” by the Tennessee Alarm Contractors Board. He lives in Nashville, TN, with his wife and 2 daughters. Born in Louisiana, Joey moved to Nashville in 1987. After graduating from Mt. Juliet High School, he began working at Entergy Integrated Solutions and during his six years with the company, Joey became a lead technician focusing on electric power production. He transitioned into the security industry in 1995 and joined the NCA family in 1999. He plays a vital role in our day-to-day operations, working closely with the service, sales, and installations departments. He’s fully certified by the Alarm Contractors Board of Tennessee. Jimmy Stein, a native of Missouri, moved to Nashville in 1939. He graduated from Hillsboro High School and Vanderbilt University. He co-founded NCA in 1997 with the goal of providing quality service at an affordable price. The NCA team is proud to carry on Jimmy’s legacy and to maintain our reputation for providing expert alarm installations and excellent service at an affordable price. NCA has a long history of vision and excellence in the home and commercial security industries. See where we’ve been and where we’re going! Jimmy Stein buys a small alarm company with 40 accounts in Nashville and names it Allied Security Systems. 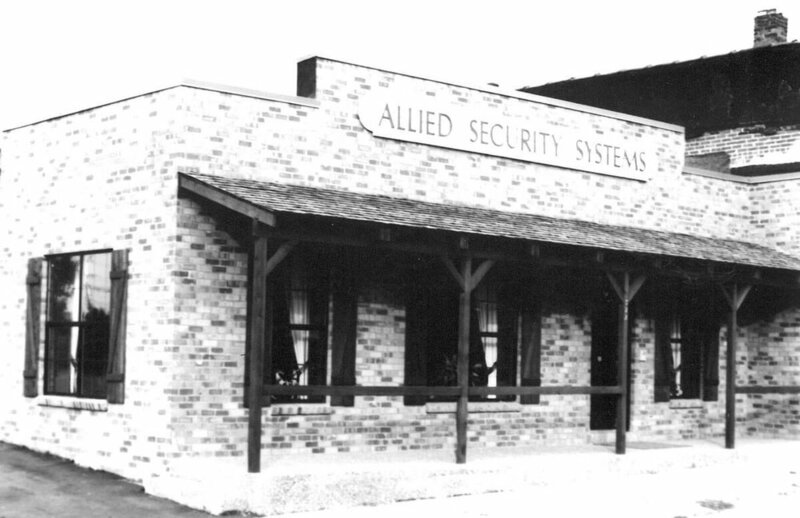 To better serve customers, Jimmy purchases a new Chevy van, pictured in front of Allied Security Systems’s first location in Belle Meade, TN. Allied Security constructs a new home to accommodate the growing company and its Central Station on 4th Avenue in downtown Nashville, TN. NCA is launched, featuring $9.95 home alarm monitoring services. A rate the company stands by 20 years later. NCA-branded vans begin to show up on Nashville’s streets and the young company leases office space at Cummins Stations. Rapid growth proves Stein’s theory to be true: people were ready for great service at affordable rates. The company purchases a building in downtown Nashville at 3304 Charlotte Ave. You can find us here today! Thousands, not hundreds, are now saving money on home monitoring services with NCA. In response to changing times and environmental concerns, the NCA fleet is upgraded with smaller, more fuel-efficient vehicles. Today - Growing, growing, growing! With more than 22,000 subscribers throughout Nashville and Middle Tennessee, NCA looks forward to continuing to provide excellent service at an affordable price.